← I Bet You’re Nervous! I am always seeking ways to instill a sense of adventure, wonder and awe in my classroom. 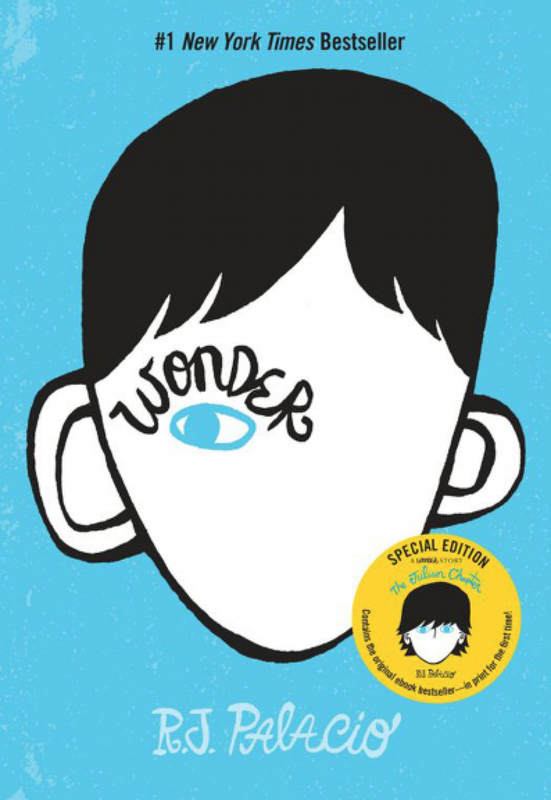 This year I decided to hook my students on our shared read aloud, ‘Wonder’ by introducing August, the main character, as a student in our class. What transpired was something beyond my wildest imagination! While making up name tags for my students prior to the first day of school, I added August’s name to the pile. Forward to Day 1, my grade 5 and 6 students filed excitedly, while visibly nervous into their new classroom. As instructed, they found their name tag on our front carpet and selected a seat as they wished. August’s name tag remained on the carpet and a seat at a desk left unfilled. I gave them my favourite “I Bet You’re Nervous” welcome and my students slowly relaxed and settled into their new surroundings. First question! “Mr. Cameron, who’s August?” “A new student who will become a valued member of our classroom, just as each of you are,” I replied. Satisfied with my first answer, another student asked, “When’s he coming?” “He’s feeling a little nervous, but hopefully will join us soon,” I answered. The kids were intrigued and clearly excited to welcome a new classmate, my goal of instilling curiosity and empathy was achieved! Forward a couple of days and many more questions later, August’s name tag still remained on our carpet. 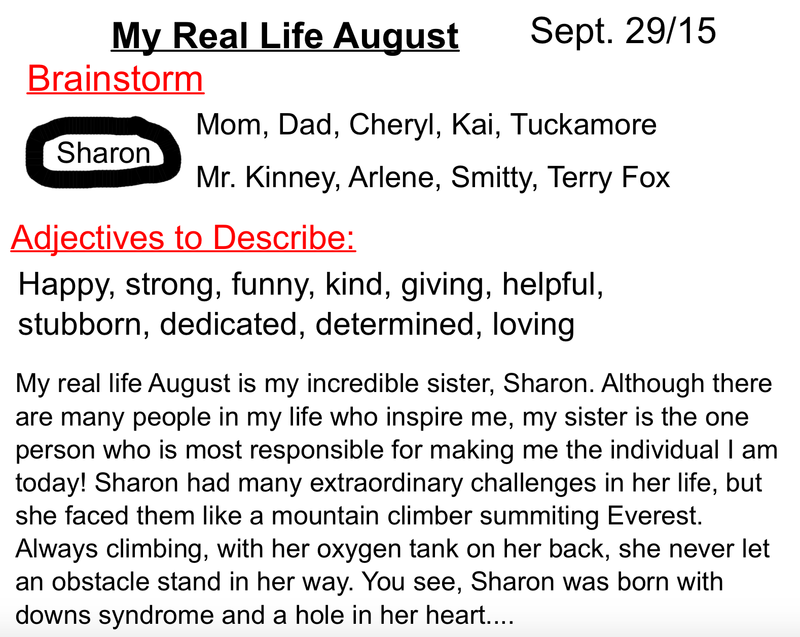 What my students had now learned from inquiring further about August was that he was home schooled and had never been to school before, he was in grade 5 and had severe facial deformities that left him looking different from us… he had an EXTRAordinary challenge. What impressed upon me was that my students REALLY wanted to meet August and couldn’t wait to welcome him to their classroom. There was a buzz in the class that spilled over into Madame Erdman’s French class, even she started inquiring about Auggie! At this point I have to say, I had mixed feelings, I was so impressed with my students and how they were authentically demonstrating our first virtue, inclusivity, however, at the same time, I started to feel a tinge of trepidation, would my students feel they had been duped? Would they be completely disappointed? Would they not trust me in the future? At this point, I fully expected the kids to realize that August clearly was NOT physically coming to our classroom, but would be virtually, through a book. It didn’t happen! As the kids listened attentively and when I was done reading a buzz of rich conversation between my students evolved. A hand finally shot up! “Mr. 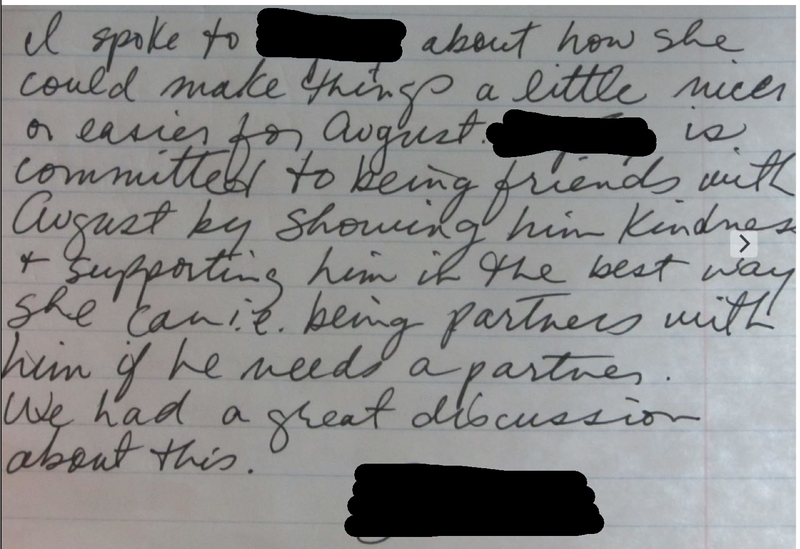 Cameron, are you reading emails from August, because he’s still not quite ready to come to our school…. ?” I paused and quickly weighed my options. Finally I replied, ” I’m reading this because August is just like you and I… he has challenges that he struggles with too and he wants to share his story with you.” I continued to read, my students grew more excited and now clearly could not wait to meet August… and I continued to learn more from, and about, them! I had them write how they thought August must be feeling about going to school ( I had them do similar activity about their own feelings on the first day of school) in their Reading Response Journals and tweeted out a few entries.. Many asked if they could bring their Journals home for homeshare (we don’t do homework)… how could I say no? The following day, my students came back with their RRJ’s and all had shared with their family members information about the new student coming to our class. 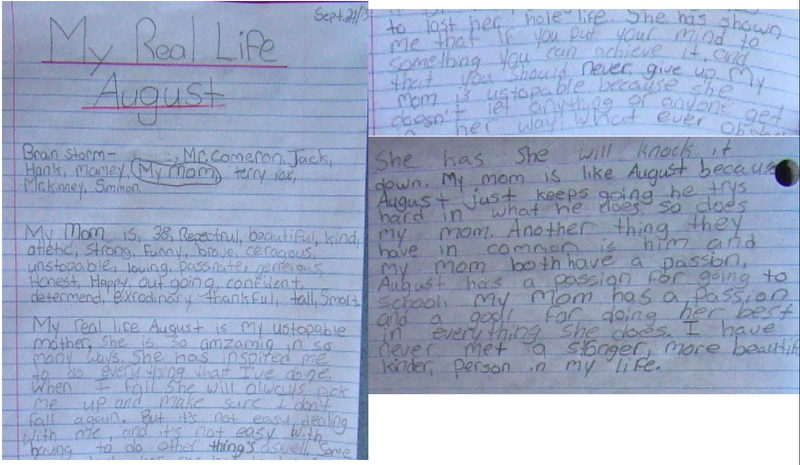 Many parents wrote comments in their children’s journals…. Clearly some rich conversation and sharing had transpired between my students and their parents, but I was now really starting to wonder if I had done the right thing. I continued to read the “emails” August was sending to me on a daily basis and now began substituting the characters in the book for the people in our school. Readers of ‘Wonder’ will already know that August had meet with the principal, “Mr. Tushman” prior to the beginning of school and received a tour. 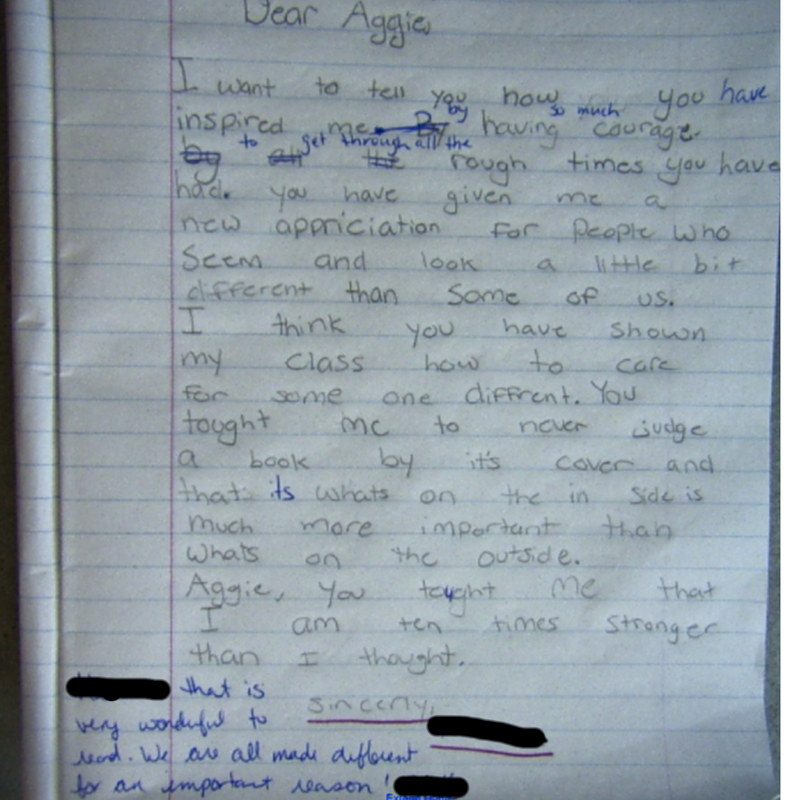 My students simply thought that Auggie was now just sharing his thoughts and feelings with us about the experience. Auggie also shared, in great detail, how he “came to life” (they couldn’t believe he included the part about the farting nurse)! As my students got to know August better they inquired with more questions as we read. They now understood that he used to live in New York City, but had moved to Thunder Bay. “How far is that?” one student wondered. We tweeted it out and within minutes had another class working on the problem with us! August was now inspiring us to do math! Was this web of fabrications becoming too big, I wondered? On the eighth day of school Madame Erdman came in the staffroom and again started inquiring about when August was coming. I told her point blank, “Marina, August isn’t real!” “WHAT?” The expressions of shock, confusion and true disappointment were undeniable! It was at that moment that I knew I had to make the kids understand that August wasn’t real! But how to do it? As my students now eagerly and confidently entered our classroom after lunch, I had them sit on our carpet in front of the SMARTBoard. I said, “Boys and girls, August is finally ready to have you see him….” A female student ran to the classroom door and looked eagerly down the hall, the others waited for what was going to happen next, a buzz of true joy and anticipation filled the room. Next I said, “I’d like to introduce you to August Pullman,” and turned on the SMART Board to reveal Auggie. My students gazed at the the image of the book cover as an incredible range of emotions flooded their faces, then rich dialogue ensued. They turned to each other and tried to piece together what they now believed to be true. Although they tried to engage me and ask questions, I remained silent. I was now learning from them. The inferences, connections, predictions and questions they were making and asking were incredible! BUT, they still were having a difficult time believing that Auggie was simply a character in a book. Many had come to the conclusion that August was real and his mom had written a book about him to share his story, others believed August was beginning to write an autobiography about himself and we were going to become characters within his book. At this point I stated, “August Pullman is a fictional character boys and girls, he is the main character in a book we will be reading this year. You’ll feel like you know him and that he’ll be part of our classroom because the author writes so well.” “But you were reading his emails, Mr. C!” a young grade 5 student persisted! More heated and lively conversation proceeded. It was time for a brain break…down to the gym we went for our favourite game of back board dodge ball. Upon returning, I laid it on the line. I told them very explicitly everything that had transpired since I first decided to write August’s name on a name tag before the first day of school. I told them why I had introduced the book the way I did, how I tried to have them catch on and how I had struggled with continuing to have them believe that August was “real”. I also told them that I had reflected on how I introduced the book and that I had no regrets as I learned so very much from each of them and that they probably learned a lot about themselves. I again reiterated that they would continue to feel that August was part of our classroom as he was going to be joining us everyday via a book. My students now began to accept this fact, there was a true sense of disappointment (even a few tears were shed), my students would not be able to meet August Pullman in person! It was now time to ask my students for feedback. 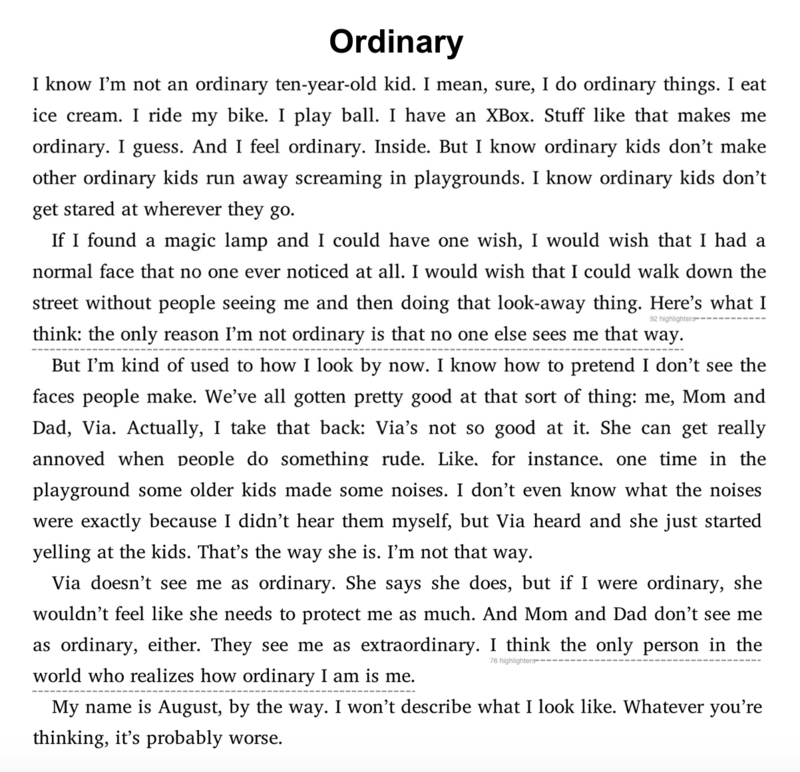 I said I had two choices at the beginning of the year, to introduce the book as I did last year, by simply turning on the SMART Board and beginning to read ‘Wonder’ or by doing it the way I had done with them. I wanted to know, if they had a choice which they would have preferred? Since I wanted them to tell me immediately and not with the influence of friends, I had them put their heads down, think and then vote. To my relief 23 of the 25 said they still would have preferred the way I introduced the book this year. Whew! Their homeshare for the night was to fill their parents in on our adventure with August…. I waited with trepidation once again! My students returned to school the following day and shared how they brought to light the realities of the new unique student in our classroom with their parents. Almost all of them had completed their homeshare! During an excursion and an open house many parents spoke with me about August, the main character in our new book. They marvelled at how “into the book” their kids were, how much they had learned about August and more importantly, how much they had learned about their children! Double whew! My students and I continued to read ‘Wonder’ and I shared the first 2 parts of my blog with them. They were particularly interested in the many comments teachers had written! It was evident that my students realized that people were deeply inspired by not just how they were learning, but by what we were sharing! They learned that their voice matters! After reading more ‘Wonder’, I challenged my students to think about who their real life August was. My students wondered who mine was. So I shared and modelled how I would go about brainstorming and start writing my paragraph on the SMART Board…. 9 Responses to Introducing Wonder! I love the fact the parents commented in journals. You have created a blog-type environment without actually blogging. Have you considered getting them to blog? I’d sure like to read their responses! This is one of the reasons why you are one of my favourite online connections! A very touching way to introduce the book. Shows that children are sometimes more accepting of the differences of others than adults. I am so glad that we teach the same grade and that it all follows under the same Ontario curriculum! Thanks for sharing and continue to share all of your creative, inspiring ideas! Wonder is a great book to develop empathy and compassion … virtues that our Catholic educators help develop in students. The way you have hooked them in the story of Auggie is inventive and engaging. You are making the novel into authentic learning for them and that is clearly shown with their desire to share their ideas with their parents. I love your approach to the novel and cannot wait to find out what happens next. I’ve just returned to junior and will be buying this book today so I can read it myself! 30% off at Chapters for teacher appreciation! Thanks for posting. I agree with cynthiagordon’s comment but would like to add that I believe those are traits that all good teachers help develop in their students. Wow Peter, what a fabulous idea. I read Wonder to my Grade 7s last year and the only reason I’m not reading it to my 6/7s is because their grade 4/5 teacher read it to them, but I love what you have done! If you are looking to blog and connect, some of my students are still huge fans and are reading the sequel. I am so inspired! I read through the post shaking a bit with trepidation and yet also clamoring with anticipation and you have still left me “wondering” Being a science junkie, I am thinking you have a strong beginning to building the culture of learning, respect, safety where rich meaningful discourse can occur when students share their ideas. I am feeling your students are already comfortable and serious about the norms ( unnecessary to define?) needed for fun, yet rigorous learning not to mention what they have learned about accepting others no matter the disability or situation. I love the “real life August” assignment! I also teach sixth grade and am reading Wonder with my class right now. I’m stealing this – thanks for sharing! In this “hi-tech” world in which we live, it is a amazing how powerful a book can still be for student and adult alike. How it gets us thinking about ourselves and others. What we do and say…especially where others are concerned. The power of words! It appears as though you are truly exposing your students to this power and giving them the opportunity to be powerful writers themselves. What a lucky bunch of kids! Good luck on your adventure together.